They formed at Westchester High School in Los Angeles in 1961. Their key founder members were Mark Volman, a native of LA (he'd been born there on 19 April 1947 and Howard Kaylan (real name Howard Kaplan), a New Yorker, he'd been born there back in June 1947. They were originally known as The Nightriders, then The Crossfires, until in 1965 their name change to The Turtles was a condition of their contract with White Whale. In their early days they were very much part of the LA folk-rock boom. Their first 45 was a Dylan song and the next two were P.F. Sloan compositions. All three achieved considerable commercial success. Their first album, which climbed to No. 98 in the U.S. Charts, contained two other Dylan compositions:- Love Minus Zero and Like A Rolling Stone, in addition to the title track and P.F. Sloan's Eve Of Destruction. They had a few good originals, too:- Wanderin' Kind was a good folk-rocker and Let The Cold Wind Blow, a protest song. Their second album, too, was a similar blend of originals and Dylan and P.F. Sloan compositions. As 1967 came they underwent some personnel changes and Bonner and Gordon, formerly with The Magicians became their new songwriters. Inevitably there was a change of style and initially a more commercial pop sound. With Happy Together, a classic love song, they enjoyed a No. 1 U.S. hit (and it also made 12 in the UK). They issued an album of the same name which was in many respects a compromise between commercialism and their own progress. It made No. 25 in the U.S. Album Charts. They followed the 45 success of Happy Together with She'd Rather Be With Me, a bouncy pop song with pleasant harmonies which made No. 3 in the U.S. and No. 4 in the UK. Their next single Guide For A Married Man was written for a Walter Matthau film but withdrawn after just one week and replaced by You Know What I Mean which peaked at No. 12 in the US. Golden Hits, which contained most of their 45 releases and two previously unissued tracks, Is It Any Wonder? and So Goes Love, became what would be their best selling U.S. Album peaking at No. 7. They're also rumoured to have released an excellent pop-punk 45 in December 1967, under the pseudonym of The Odyssey. A year later they recorded a Christmas single with Linda Ronstadt as Christmas Spirit. From 1968 their music became more experimental, although when White Whale became impatient for another big hit Volman and Kaylan came up with the brilliant Elenore, which was a big transatlantic hit peaking at No. 6 in the U.S. and No. 7 in the UK. Their Battle Of The Bands and Turtle Soup albums are both worth investigation. They enjoyed further minor hits, of which Lady O, a Judy Sill composition, was the last 45 released with their approval. Many of these later 45s were included on their More Golden Hits album along with two previously unissued tracks:- We Ain't Going To The Party and Cat In The Window, The first of these was intended for an album, Shell Shock, they were working on which was never released. Now heavily immersed in the flower-power movement they were recording numerous deranged tapes which White Whale wouldn't release. The record company continued to release their own choice of material but none of it met with much success commercially and, in September 1970, the band disintegrated. Volman and Kaylan both later joined The Mothers Of Invention, then in 1972 they worked as a duo first as Phlorescent Leech and Eddie and later as simply Flo and Eddie. 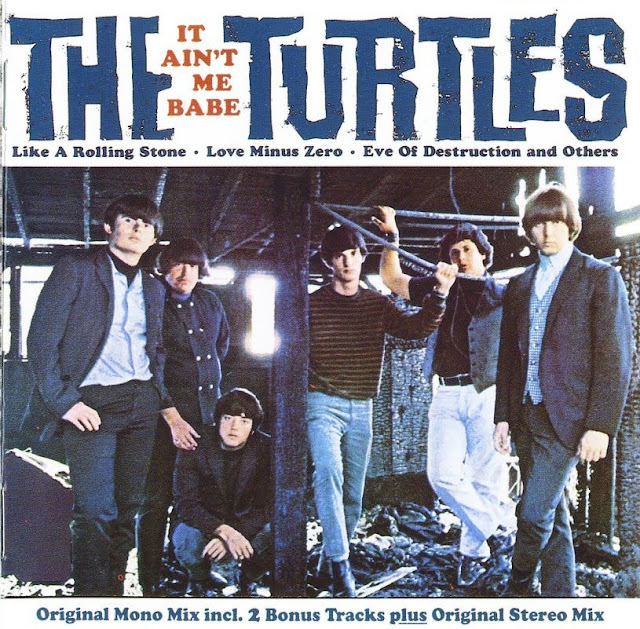 Much of The Turtles' material has stood the test of time quite well, and whilst they were most successful as a folk-rock/harmony outfit The Turtles main significance for this book was as part of the flower-power movement, even though that movement was ultimately to prove their downfall. Links are down, any chance of re up please? thank you! Links are down, any chance of re up please?